Tiny House Homestead: The Best Toothbrush Ever! 4,500 bristles, 2x more than ordinary brushes, help improve gum health with wide soft massage. Healthy gums reduce risk of heart disease. 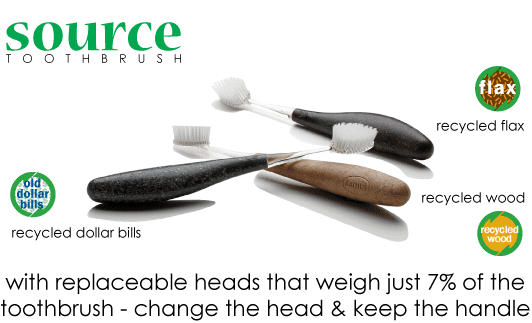 Patented head has bristles that radiate out from a narrow head, giving a wide mass of bristles for comfortable massage of the gums and efficient removal of plaque. Slim, flexible neck and narrow head makes brushing in tight spaces easy. Ergonomic handle helps reduce pressure on sensitive gums and teeth. Reversible right hand or left hand position, improving brushing effectiveness and accuracy. RADIUS Source Toothbrush is 50% Petroleum Free, BPA Free, Latex Free, Gluten Free, Phthalates Free. Bristles made from 100% Vegetable oil. The name of this particular brush is the Radius Source recycled toothbrush. The handles are ergonomic and just by switching which way you put the brush head in you can make it fit either a right hand or left hand. The handle is meant to be reused. You replace the head every three months. The handles are made of recycled paper, dollar bills, wood, and flax. I was pleased to find that you can purchase them for around $6 a brush, which includes an extra head, on Amazon. I found a 3 pack for $6.95 each and ordered two. With the included replacement heads, this means I won't have to buy another toothbrush for 3 years! Can't beat that! The best part is that I love the way my mouth feels after brushing. My teeth are clean and my tender gums are in tact. I am very pleased with this toothbrush.